Up front, new style BREMBO T-drive brake rotors grasped by Monobloc calipers connected to the exclusive Suzuki Motion Track Anti-lock Brake system provides strong, controlled braking. The precise and smooth SHOWA Balance Free suspension keeps the sticky Bridgestone RS10 tires in touch with the road. All of this forward-looking motorcycle technology is covered in all-new, wind tunnel-developed bodywork that’s uniquely GSX-R.
New 32-bit Dual Processor Engine Control Module (ECM) blends Suzuki’s vast street-going EFI knowledge with the intelligence from Suzuki’s race-winning MotoGP program. 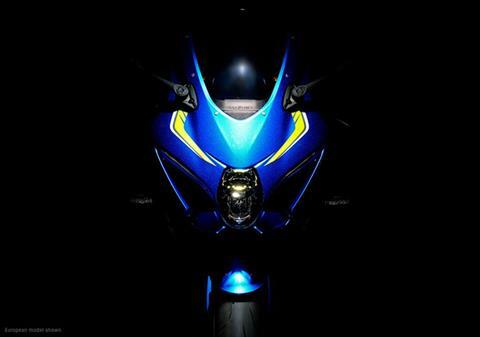 GSX-R1000R riders will get sportbike performance without peer while simultaneously receiving polished street manners. 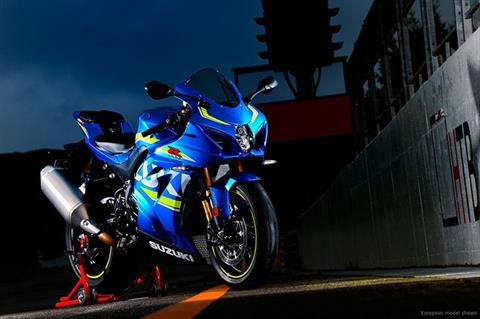 Using MotoGP knowledge, Suzuki has fitted an Inertial Measurement Unit (IMU) on the new GSX-R1000R. The IMU provides six direction, three axis motion and position information to the ECM so instantaneous adjustments can be made electronically to the engine and chassis components that influence performance. Exclusive to Suzuki, the new Motion Track Anti-lock Brake System brings additional control to anti-lock braking (ABS)**. Like a conventional ABS system, the Motion Track Brake System provides the appropriate amount of braking force for the available traction. When the IMU detects the rear wheel lifting up from extreme braking forces, the ABS control module will adjust the front brake pressure to reduce the rear wheel lift. If the IMU senses the motorcycle is leaned over when the brakes are used, the ABS unit will adjust the brake pressure to an optimal amount to help maintain good braking force and tire grip. A new version of the 3 mode, Suzuki Drive Mode Selector (S-DMS) system lets the rider select the power output levels of the engine to match riding ability and conditions. The new Suzuki Launch Control System provides GSX-R1000R riders a competitive advantage when launching their motorcycle at the start of the race. This system will modulate power so the rider can concentrate on clutch operation. The new Suzuki Bi-directional Quick-shift System lets GSX-R1000R racers shift faster than ever before. By ignition timing manipulation on upshifts and electronic throttle body manipulation on downshifts; clutch-less shifting helps deliver faster and more consistent lap times. The new, aluminum twin-spar style frame was designed using FEM analysis technology to place strength is the proper places, the new frame is also 10% lighter than the prior generation GSX-R1000. The spars of the frame are set 20 mm closer to help improve aerodynamics, looks and to bring more comfort to the rider. Racetrack-developed links connect the single SHOWA Balance Free Rear Cushion lite (BFRC-lite) shock to the braced swingarm. The BFRC-lite’s innovative design controls damping force outside of the shock body to not only control how the suspension strokes but helps smooth reaction over bumpy surface or when the chassis is pitched during braking. The result in a new level of response in a race track environment, and new standards of rider feedback and comfort during street riding. The SHOWA Balance Free Fork (BFF) uses race-level technology to bring a new standard of damping force responsiveness to a SuperSport motorcycle. This suspension’s design controls damping force outside of the spring chamber so the fork precisely maintains consistent damping regardless of its stroking action. With the BFF the rider enjoys an unparalleled level of surface feedback and ride compliance. BREMBO Radial Mount Brake Calipers provide the rider with strong braking performance combined with superb feel. The GSX-R1000R rider will be able to sense the braking force as the lever is squeezed. BREMBO Radial Mount Brake Calipers provide the rider with strong braking performance combined with superb feel. 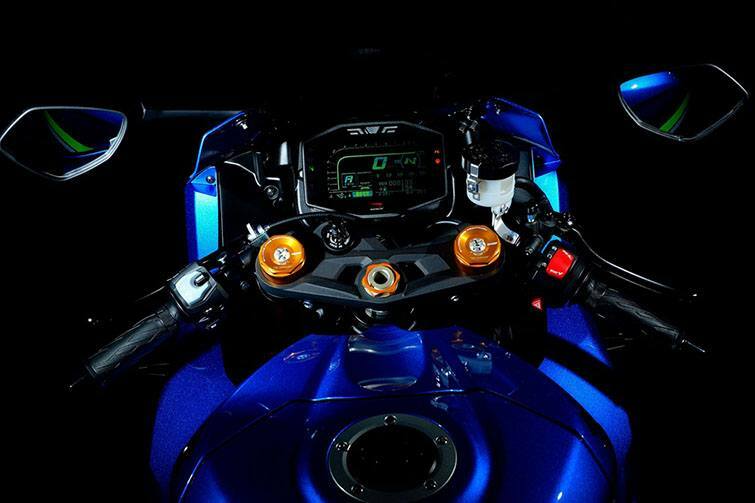 The GSX-R1000 rider will be able to sense the braking force as the lever is squeezed. The new BREMBO T-drive Brake Rotors feature two methods of attaching the 320 mm floating disc to the carrier. There are five conventional floating rotor spools that maintain the rotor’s relationship to the caliper, and there are five new-design T-drive fasteners that enable the rotor to absorb more braking energy that a disc with conventional spools alone. As a result of the larger diameter discs, and the energy they can absorb, the new GSX-R1000 has more braking force available to the rider than ever before. Exclusive to Suzuki, the new Motion Track Anti-lock Brake System brings additional control to anti-lock braking (ABS). Like a conventional ABS system, the Motion Track Brake System provides the appropriate amount of braking force for the available traction. When the IMU detects the rear wheel lifting up from extreme braking forces, the ABS control module will adjust the front brake pressure to reduce the rear wheel lift. If the IMU senses the motorcycle is leaned over when the brakes are used, the ABS unit will adjust the brake pressure to an optimal amount to help maintain good braking force and tire grip. Unique to Suzuki, new lightweight six-spoke wheels reduce unsprung mass and have been designed to handle the braking and drive forces that a GSX-R1000R can create. Aerodynamic Bodywork was created by Suzuki styling designers and engineers using numerous wind tunnel tests to achieve a slippery shape and compelling appearance. Narrower than ever before, the GSX-R1000R’s shape directly aids performance by improved handling and top speed on the racetrack. The reasonable sport riding position is created by a carefully crafted relationship between the clip-on’s, footrests and seat. The top of the fuel tank is lowered 21 mm to make it easier for the rider to tuck in on a racetrack straightaway. The shifter and rear brake pedal are adjustable in relationship to the footrests, and the hand controls are adjustable in relation to the grips. The front brake lever has a slot machined in the end to prevent wind pressure from applying the front brake. Special GSX-R1000R logos are applied to the tail section of the motorcycle denoting its unique capabilities and status. 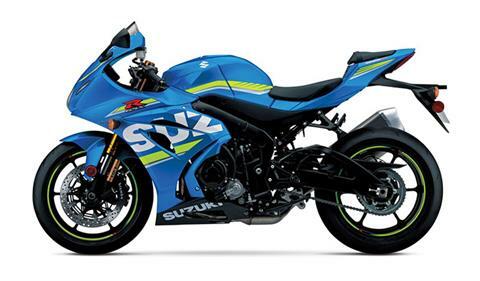 The blue GSX-R1000R features a paint and graphics scheme that looks as if it was directly lifted from Suzuki’s race-winning MotoGP bike. The black GSX-R1000R model features tri-color blue Suzuki Racing Heritage stripes on the fairing, sparkling blue wheels, and blue-anodized outer tubes on the SHOWA BFF fork. 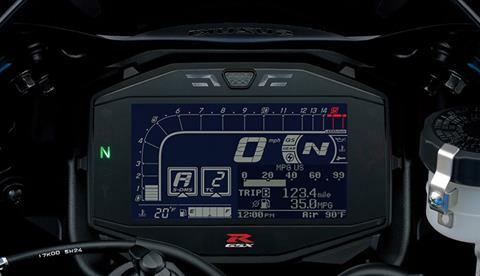 The new LCD Multi-function Instrument Panel was inspired by the GSX-RR MotoGP dash, and is laid out so the rider can quickly acquire the tachometer bar, speedometer digits, and other operational information that’s essential - especially at racetrack speeds. 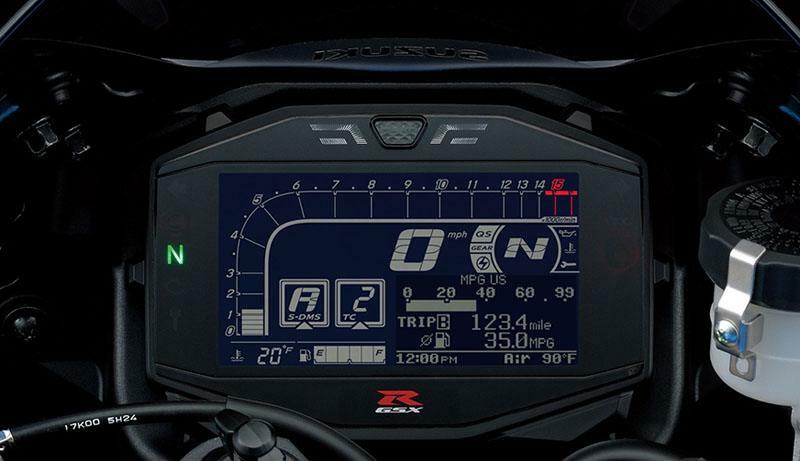 The GSX-R1000R ABS’s panel, with a unique black face with white digit display, is a critical interface as it provides setting information bike’s advanced electronic rider aids. A race-ready, lightweight battery has reduced mass that is beneficial for use in closed course competition, and has ample capacity to electric start the engine and supply power to the advanced electronics. The short stroke engine has a 76 mm bore versus a 55.1 mm stroke, yet is narrower than the prior generation GSX-R1000 thanks to effective design. Advanced suspension uses a SHOWA Balance Free Fork and Balance Free Rear Cushion to combine with new Motion Track ABS-equipped BREMBO T-drive 320 mm dual front brake rotors and Monobloc 4-piston calipers for extraordinary handling and stopping performance. Aerodynamic bodywork is sleek and stylish while housing a new, bright LED headlight and Suzuki Ram Air Direct (SRAD) ducts that feed a high volume of intake air for astonishing top speed muscle. Blacked out instrument panel and GSX-R1000R logo warns others that your bike is something extraordinary. 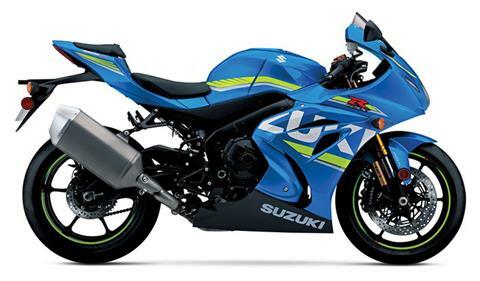 Based on Suzuki’s race-proven six-speed close-ratio transmissions, the new GSX-R1000R features vertically staggered shafts to reduce overall engine length.